We can get discounted rates on both car ferries for you. Most discounted fares cost generally in the region of £65-95. Just fill out the form below, and we will get you a price, and then book it for you and send you an e-ticket. Hovercraft – Portsmouth/Southsea – Ryde. (The quickest and most fun!) 8 min crossing; 10 min taxi to us.) But Southsea is not so convenient to get to, on public transport. Although you can park long stay in good carparks there. You can of course travel as foot passengers on all of the Car Ferries too, which does work out slightly cheaper than the fast passenger jets. You can’t book in advance on any of these (unless you are booking a rail through-ticket – see info below). The only way to get a pretty good discount on these, is if you book a rail ticket with a discount rail card such as the Network Card – as it takes a percentage off the whole through price including ferry. 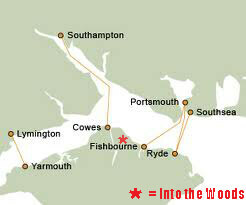 Going by Rail via Southampton – Ask for through ticket to W.Cowes (Red Jet- 25 min crossing) arrives 15 mins from us; or E.Cowes (car ferry 50 min crossing) cheaper but arrives 5 mins from us. Then taxi. Going by Rail via Portsmouth – Ask for through ticket to Ryde Pierhead (Fast Cat 15 min crossing) (top end of pier for taxis); or to Ryde Esplanade (little extra train takes you down the long pier to the main road and bus station). Then taxi or bus. If you need any extra info – please contact us.